The CZone® digital control & monitoring network simplifies installation of electrical systems through the replacement of complicated, cumbersome wiring to switch and fuse panels, with state-of-the-art, robust interfaces and light NMEA 2000 network cable. It also provides a sophisticated solution via the automation of complicated control and monitoring issues associated with today’s onboard systems. Installers recognise an immediate benefit with reductions in cable usage, harness weights and installation times. 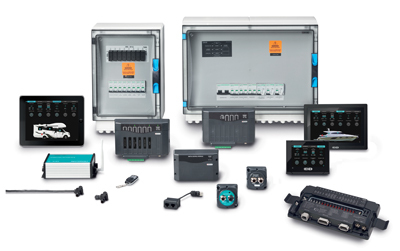 The CZone system also integrates many standalone components into one intuitive system. Wiring is dramatically simplified as the CZone system is designed to remove complex switching clusters and wiring runs. 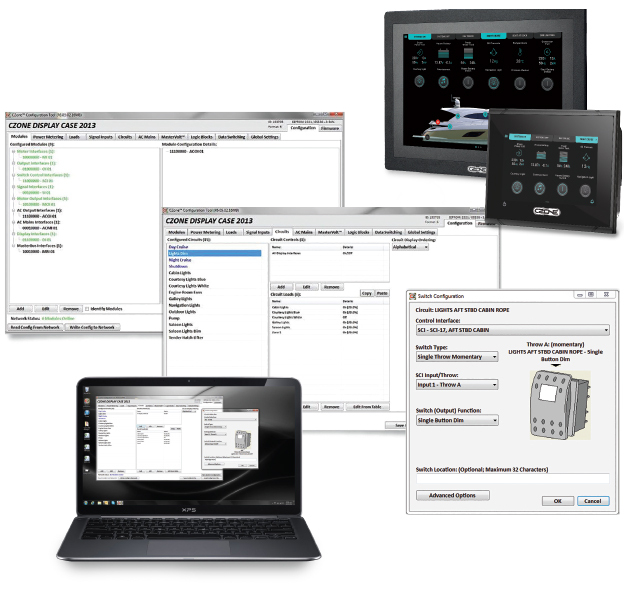 Modules can easily be added into the system to best suit the OEM and end-users’ needs. Wiring DC systems can be complex and installation time can be extensive. The larger the system, the more wire is required, which creates weight and space concerns, not to mention increased cost and complexity of design and manufacturing. Basic maintenance and trouble shooting of traditional wiring systems can be difficult to manage. Switch panel wiring is complicated and extremely labor intensive to install. Cable runs are long and have multiple conductors. Switching of common circuits is complex. Long wire runs require larger cable, adding weight, increasing cost and reducing space. The CZone system decentralises the DC power distribution system, locates circuit control and protection modules closer to loads to shorten cable runs and reduce the size of conductors, significantly decreasing the cost and weight of the electrical wiring harness. The system replaces complex wiring with a single data wire. Complex switch panel wiring removed, replaced with single data cable connection. The grouping of multiple loads into common areas (zones) with Output Interfaces is the key to the system. Results in less working hours and installation materials, plus fewer and thinner cables. Historically, generating a configuration for and programming a system is a chore that requires a significant amount of training. The Configuration Tool of the CZone system offers simple, straightforward programming that is easy to learn and to use. The CZone system Configuration Tool allows the installer to set up programming parameters on a standard PC (use an USB CAN Adapter, product code 80-911-0044-00), upload a saved configuration into the CZone network and simultaneously program every interface onboard. Changes and customisations can also be made from the Display Interface and downloaded back to the PC overriding the master configuration. The master template file is now ready to go and can be used on multiple vessels or vehicles during installation.